They make a strange pair. One’s tall and good looking, somewhat shy, but always obliging. The other is short, sullen and prone to spurts of anger. A little guy whose toothless frown masks a truly generous heart. Lung and Hung. Literally, in Chinese, the Dragon and the Bear. Our two main characters. We’ve been looking at a thousand versions of them these past weeks. Nearly a year’s worth of footage. 250 tapes. It’s amazing, the changes we’ve forgotten we’d actually witnessed. New haircuts, new skills, new homes, new beginnings. Right from the start, we knew we wanted to tell Hung’s story. We’d arrived in Hong Kong in January for a 48-hour shoot. It was a spur-of-the-moment decision, triggered by the chance discovery that Wai Tung was managing a football team made up of homeless people. Despite being up to our eyeballs in deadlines, we felt compelled to find out more. Our first trip was brief. But it was enough. We returned to Singapore knowing we’d just mapped out what we would do for the rest of the year – make a documentary about the team. Maybe it was his intense gaze. The sad eyes. That slouchy walk. The way he hung back as other players attempted to talk to us. Maybe it was because he had a genuinely warm smile. It’s hard to explain why, but we were immediately drawn to Hung. Lung, joined the team two months later. 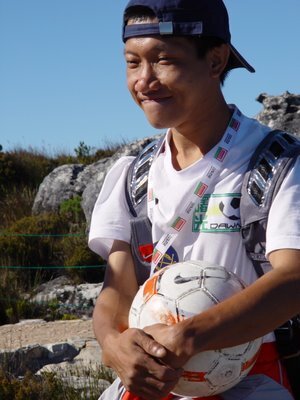 We first met him at Shamshuipo’s Maple Street Football Playground. This was where the players trained; where many slept at night. Our decision to follow him was something of a no-brainer. One look at Lung – young, energetic and smart – and the one question that springs to mind is, WHY? Why are you here, on the streets, alone? What happened? Over the months, we’d find out. Little by little. Getting into the lives of our characters was tough. It took patience. And tapes. Stacks and stacks of tapes. Our method was simple. We hung out with the players as much as we could. We told them that our cameras were always rolling, but they were free to stop us from filming if and when they felt uncomfortable. Our characters would open up, then shy away. They’d disappear for weeks on end. Be completely uncontactable. We’d think of giving up, and then they’d call – with unexpected invitations to their new homes for dinner, or to a cha chan teng for late-night supper. Or they’d come sit next to us at break time during football training and surprise us with insights, information, stories about their lives. Stints in prison. Time with the triads. Loneliness. Death. Despair. These guys have seen it all. Yet in 10 months, we’ve also witnessed hope and a kind of happiness that comes with knowing that there can be new beginnings. 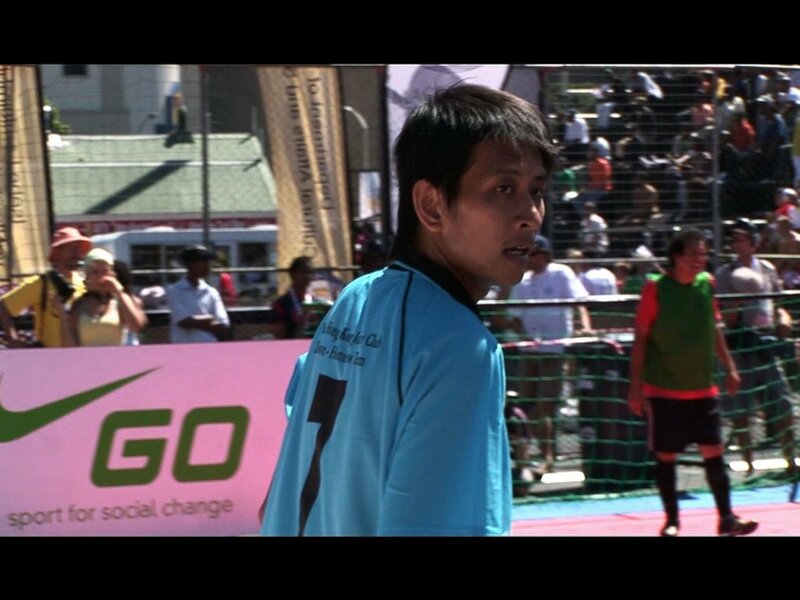 At the Homeless World Cup in Cape Town, Lung and Hung shared a room and invited us over for many a late night chat. They became fast friends and we like to think that we became their friends too. During our last week in Hong Kong, the boys threw us a farewell party. They brought presents – a plastic doll that Lung said resembled James (it did), and a handmade table ornament with a reminder in Chinese, “Don’t forget us”. Previous postSeeking Interns Next postBan Censorship!